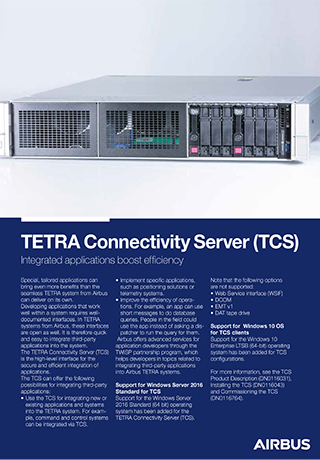 TETRA Connectivity Server, TCS Server, offers the deepest level of integration to a TETRA network for applications. There is flexible scalability and upgradability as the network grows. There is also a partner program which actively supports application development. How to use the TCS Server? Integrating new or existing applications and systems into the TETRA system. Command and control systems, for example. Implement specific applications, such as positioning solutions or telemetry systems. Implement functions more cost-efficiently. For example, your application could use short messages for database requests. When you need to integrate management systems, choose the TETRA Connectivity Server, TCS Server. For communication integration, choose the interface to the Tactilon RCS 9500 dispatching solution. When integrating applications, choose the interface to the Mobile Data Gateway, MDG. Simple to use SOAP/XML interface.